Massanutten Village has 1,052 private residences plus 730 timeshare units situated on roughly 1500 acres and located on 52 lane miles of roads, to include those in the Piney Mountain subdivision which is located outside the main gate at the northwest corner of Route 33 and Route 644 (Resort Drive). MPOA MPD Officers are currently responsible for law enforcement in this developed area of Massanutten Village and annually responds to more 9-1-1 calls than any town law enforcement agency in Rockingham County. MPOA MPD is privately funded largely by the property owners of MPOA. Yet, the last section established that more than half of the vehicles entering into Massanutten are not associated with MPOA — they are from the general public, and are associated with Great Eastern employees, owners of Woodstone Meadows timeshares along with their guests, and visitors, who patronize Great Eastern Resorts businesses (e.g. ski slopes, golf course, and restaurants). If this large number of vehicles and a correspondingly large number of individuals cause a proportional share of law enforcement issues, their very numbers exacerbate traffic, congestion, noise, and other such problems without paying for an appropriate share of law enforcement services. An incorporated town of Massanutten would include all of Massanutten Village East, West, and Kettle areas plus the Planned Residential Community of Woodstone Meadows and the Planned Commercial Developments of Village Festival and Massanutten Station. The total area of an incorporated town of Massanutten could be as much as 7,802 acres, which is a significantly larger coverage area for an incorporated town of Massanutten Police Department over the area currently covered by the MPOA MPD. However, the total number of private residences and timeshares in an incorporated town of Massanutten is only a small incremental increase over that currently covered by MPOA MPD. 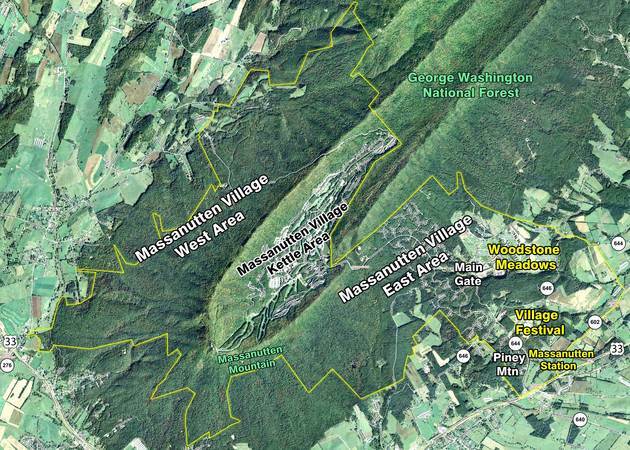 An incorporated town of Massanutten Police Department would cover a total of roughly 1,125 private residences and 1,230 timeshare units located on roughly 80 lane miles of roads, to include those in the Piney Mountain subdivision. An incorporated town of Massanutten Police Department would cover an area that included all current Great Eastern Resorts businesses and offices as well as Woodstone Meadows timeshare units. Thus, it would include a large part of the vehicles entering into Massanutten Village who are not associated with MPOA. A map of the total coverage area is shown below. If the ownership of Massanutten Village roads were turned over from MPOA to an incorporated town of Massanutten, this means that all Massanutten Village roads would no longer be private roads. They would be public roads open to free access by the general public. Therefore, an incorporated town of Massanutten would no longer need Gate Attendants at the entrance to Massanutten Drive. And, an incorporated town of Massanutten could legally have its own police department, to include a transfer of MPOA police assets as a cost savings point of departure for incorporation. The funding of town law enforcement services via taxation could be done on a shared basis by town property owners, citizens and businesses as well as by the visitors to the Massanutten Area. Also, law enforcement funding could be augmented by state and federal law enforcement grants. This type of shared funding profile is similar to other towns in the County. The Massanutten Area could also benefit from town incorporation providing citizens with the protections of a town government police force with the authority to better serve the citizens and with full capacity to uphold the laws of the town, Virginia, and the United States, as an integral part of the national law enforcement community. The town police force could readily enter into agreements with other state, county, town, and city police departments for the mutual benefit of law enforcement across jurisdictions — one such local mutual agreement already exists regarding drug related law enforcement. Police Officers of an incorporated town of Massanutten would have less civil liability than the MPOA «Special Conservators of the Peace». And, an incorporated town of Massanutten Police Department would have more transparency, to include public records. For example, the arrests made by the MPOA MPD were available for 2009 (and reported above), but not made available for 2010. Since the MPOA MPD is a private security operation, MPOA exercised its right in 2010 to no longer make such arrest information available to the public for privacy reasons despite the fact that this arrest information is available from the Rockingham County Clerks of the General District and Circuit Courts. Such arrest information would be available to the public if Massanutten were incorporated into a town. If the MPOA MPD assets were to be transferred to an incorporated town of Massanutten, they would need to be augmented to cover the additional area, lane miles of roads, and population. An incorporated town of Massanutten Police Department would likely require two (2) Police Officers on duty 24 hours a day, 7 days a week, and 365 days a year. This is possible with a department of eight (8) Police Officers, two (2) Police Commanders, a Police Chief, and an administrative staff member. The town police department would also likely need an increase in the police vehicle fleet by one or two, to include all the necessary vehicle equipment such as radios, computers, dashboard cams, and radar guns. The newly constructed 2,000 square foot MPOA MPD building would be more than adequate to act as a Town Police Station with its location in the middle of Massanutten Drive acting as a an effective deterrent to crime for an incorporated town of Massanutten. The current staff positions occupied by the MPOA Gate Attendants would no longer be necessary. But, they could be functionally replaced by an informational attendant, who could assist visitors entering into Massanutten Village; such an attendant could be employed by Great Eastern Resorts to assist visitors patronizing their amenities. It was determined that an incorporated town of Massanutten Police Force could operate on an annual budget of roughly $875,000. It should be noted that employees in an incorporated town of Massanutten Police Force would be entitled to benefits under the Virginia Retirement System. This may be attractive from the standpoint of hiring and retention of employees.